Free Fire Striker with 5 Pack Emergency Blankets (Extra Large - 63 x 82.5 inches) - Earthquake kit, Bug Out Bag, Camping. AKA Emergency Blanket, Thermal Blanket, Survival Blanket, NASA Blanket. This NASA developed mylar PET space blanket material retains up to 90% of a person's body heat. A two degree difference in body temperature can mean the difference between life and death. Be prepared. Our EXTRA LARGE blanket can hold more than one person and is big enough to be useful as a makeshift shelter. 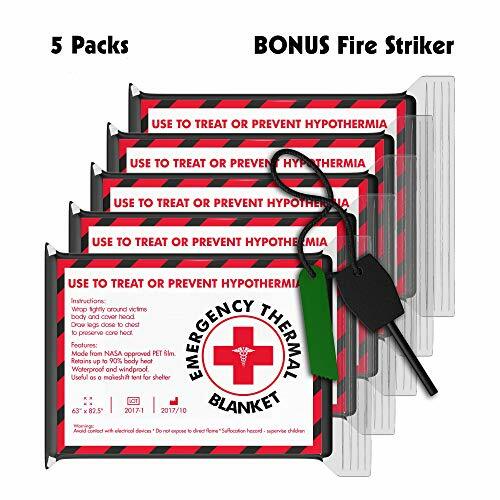 A BONUS fire striker comes with each 5 pack to compliment this hypothermia prevention package. Make fire no matter what the weather. Every order comes with 5 individually wrapped and labeled EXTRA LARGE sized survival blankets and ONE fire striker. Excellent gifts for friends and loved ones. Everybody should have an emergency blanket in their car, home and place of business. Be prepared for a variety of disasters: Accidental cold water immersions, earthquakes, stranded vehicles, shock, accidents, etc. Survival emergency blankets are like a SWISS ARMY KNIFE with unlimited uses: Shelter, rain water collection, emergency signal, shade, sleeping bag liner, bivvy, trail marker, rain poncho and so much more. SIZE MATTERS: X-Large size holds 2x people, use as shelter, etc. SWISS ARMY KNIFE: Earthquake kit, Bug-out bag, Marathons, Signal, Marker, Etc. If you have any questions about this product by Emergency Thermal Blankets, contact us by completing and submitting the form below. If you are looking for a specif part number, please include it with your message.